I've spent most of the day working on a game called Splosh4k. It is admittedly heavily inspired by the indie game Unfinished Swan. The goal is simply to paint enough of the level using as few shots as possible. I might do something like adding a restriction on how many shots are available on each level, but I'm not sure. Any comments, feedback and ideas are warmly welcome! I think the gameplay might need to be improved a bit. I could also add new maps or perhaps even a built-in editor (some 170 bytes left still). It's kinda fun, but the progress bar isn't really a good indication of how much you revealed. 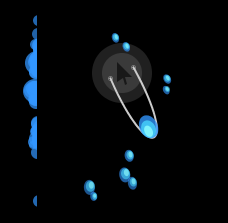 You can splash one half of the level and proceed to the next. It would also be nice if you were able to move the cursor around and move through a level, but I fear that won't fit in 4K eh? Nice job on the physics and graphics! Regarding the progress bar: You're not supposed to cover *the entire wall* - that'd take ages, literally. As it is, you have two cover an amount of pixel that is based on which level you're on (more pixels for higher levels) and the total length of the wall pieces. But yeah, I suppose there could be some more detailed measurement involved. About moving around: Yeah, I've thought about it. I think it'd be too easy if you could move around at will, but I've considered making bigger maps and having the launch site move around automatically. Or something like that. Since what's painted is actually stored in a BufferedImage, there's a limit on how big the levels can reasonably be. A few screens' size, perhaps. I liked the game, it was kindad challenging, although making there be a max amount of shots per level. I think the objective of the game is too simplistic, it doesn't offer the player any real incentive. The paint gun is a fantastic idea though & is implemented realy well. Firing off lots of paint & seeing the mayhem unfold looks excellent, and is fun to do. I think it just needs integrating into a game with a stimulating objective. Perhaps a paintball combat themed side-scrolling platformer? As the paint itself adds the colour to the level, solid grey terrain would look just fine. I think that would be great. I dont think it would work in a 4k competition though. It would have to be too complex to fit in 4k.